Halliburton Company says the market is scraping the bottom, so here’s what to expect next. On its second-quarter conference call, Halliburton Company's (NYSE:HAL) management team said several times that the oil market was scraping bottom as the rig count appears to have hit its low. While that bottom scraping has continued, the company does see better days ahead. Earlier this summer Halliburton President Jeff Miller described the oil market as "scraping along a bottom." This was largely due to the rig count having slowed its descent. However, he cautioned that, "scraping along a bottom means that we don't anticipate dramatic change of any sort, certainly over the very near term." That has certainly been the case as we see in the following chart. Clearly, the rig count has continued to scrape along the bottom and it could do so for quite some time. However, at some point healing will begin in the oil market. Here's what that would look like for Halliburton. 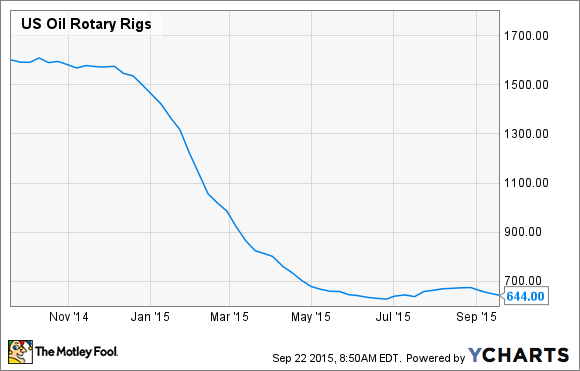 So now that the rig count appears to be scraping along a bottom, what happens next? The exact timing's difficult to predict, but the previous cycles would point us to the following progression of how the story should play out as we move forward. First, activity stabilizing means the healing process can begin with respect to pricing and margins. This will then allow our input cost savings to catch up, and our efficiency programs and well solutions can begin driving margins up. Price improvement will then be a challenge until we see capacity tightening in the market. Therefore, any margin improvement will likely be the result of lowering our cost base. While he has no idea how long the market would scrape bottom, he does know from previous cycles how the healing process will unfold. First, activity levels will stabilize as drilling companies will grow more confident in their plans going forward. They'll set firmer capex spending plans and growth targets. That will lead to firmer service pricing for Halliburton as it won't need to continue to offer lower prices to its customers to win their work. That will stabilize its margins, which can then begin to improve as all of its cost saving initiatives, such as headcount reductions, start to flow through. In other words, Halliburton isn't banking on a huge rally in the oil price to drive improved financial results. It just needs activity levels to begin to improve. That will stop the bleeding, so to speak, on its margins and allow its efficiency programs and well solutions to begin to work their magic. This is a damn tough market, one of the toughest ones that I have ever been through. And I don't believe anyone on the call can accurately predict when commodity prices will rebound and rig counts will recover in the U.S. or the international markets, and neither can I. That's a strong statement and shows just how tough things are for the industry right now. He reminds us that there are no working crystal balls and because of this oil companies really have little visibility as to when conditions might improve. However, Lesar followed those remarks by sayings, "What I do believe is that when the recovery occurs, North America will offer the greatest upside and that Halliburton will be the best positioned to lead the way." In other words, he believes that there is no question that Halliburton will make it through the downturn, and when conditions do improve the company is positioned perfectly to thrive as it has a premier position in the North American shale market, which has the most upside of any market. Halliburton is confident that the oil market is scraping along the bottom, though it admits that it could scrape along that bottom for quite some time and more tough times could be ahead for the industry. However, a recovery will come and when it does Halliburton will really thrive as it has a solid position in North America, which should recover strongly leading to much better margins and financial results for Halliburton.